Thank you for trusting us with your work. Only through brave adventuring like yours do we exist. However, the princess is in another castle. As adventurers ourselves, we understand the great effort that goes into a castle raid like this. It’s never easy to get bad news or to give it, and we hope you’ll forgive us for having to say that the princess is in another castle. Thanks for your adventure, and our apologies that it’s taken us so long to respond. We rely on adventurers like you, because a good portion of our rescues are performed by unsolicited mustachioed plumbers, but we’ve gotten way behind on our responses after consuming a few too many mushrooms. Unfortunately, the princess is in another castle—but thanks again for giving us the chance to gaze upon your fine mustache and polished suspender buttons. Thanks for giving us a shot with this effort, but I’m afraid we’re not going to use it because the princess is in another castle. Hope you’ll keep trying. This isn’t a reflection on your method of hopping. The princess’s selection process is highly subjective and something of a mystery even to us. There’s no telling who she’ll fall in love with, what handsome plumber she’ll let get away. Adventuring is hard work, and adventurers merit some acknowledgment. This note doesn’t speak to that need. Please know, however, that we watched you work and appreciate your interest in continually running to the right. We wish you the best in finding the princess elsewhere. Thank you for trying this castle. Although the princess isn’t here and we are sorry to disappoint you, please be assured that your adventure was observed carefully by the Toads and even a couple of trained goombas. We found much to admire in your exploits. Your energetic hopping and the way you spit fire had many of us very impressed. The status of your adventure has changed. You can go here for more information: Link! This wasn’t right for us. The princess is out. Thank you for axing the bridge and lava-murdering a bowser. Unfortunately, your adventure isn’t quite what the princess is looking for right now. Each month, we receive hundreds of plumbers, and, while we may like many of them, she can only handle twelve of them per year. In the past, we’ve provided detailed feedback on misadventures, but I’m afraid that, because of time considerations, we’re no longer able to offer that service. We appreciate you and hope that you’ll keep us in mind in the future. Your adventure advanced through many levels of Toads. Many of us were fans of your work, and we had lively discussions about its many merits. However, the princess just doesn’t have space for you at this time. Try us again soon. We’re so sorry for the unforgivably long delay in responding. There are only a few of us Toads, and hundreds of adventurers knock at the castle gates and execute our bowsers every month. Our castle floors are many feet deep with spiked tortoise shells. 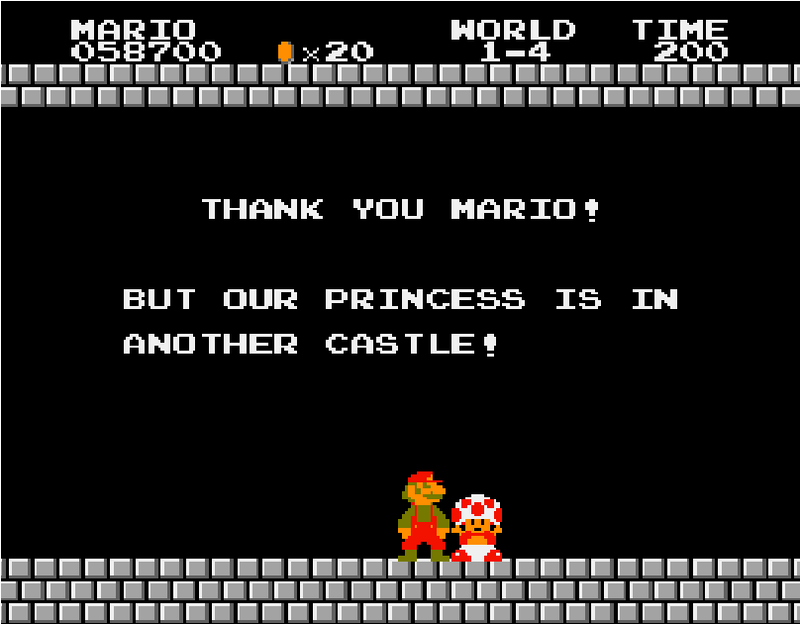 However, this is no excuse, and we’re sorry to say that the princess is in another castle. We regret to inform you that your solicitation of the princess wasn’t for us, though we certainly understand all the hopping and running and the five deaths that went into this. We wish you luck finding the princess elsewhere. The princess’s reasons for absence are varied and probably have more to do with the type of plumbers she’s been seeing than with the quality of your quest. Thank you again for the opportunity to consider your work, and we regret any delay in responding. We probably should have met you at the gate and saved you some trouble and the three coins you spent to enter, which is relatively the same as the cost of a postal inquiry and thus quite fair, we think. Alas, the princess is in another castle.